This pattern became popular in the late 18th century. 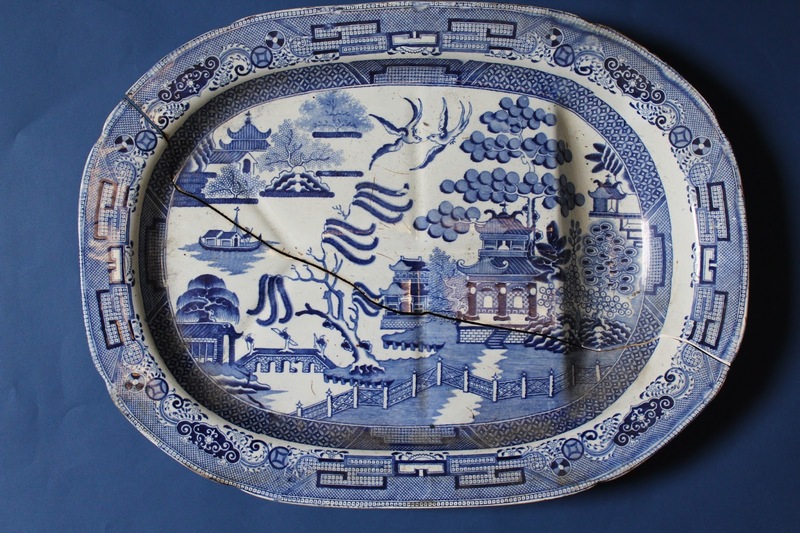 The potteries adapted the patterns on blue and white ware which was imported from China. Transfers were replacing hand painted ware. 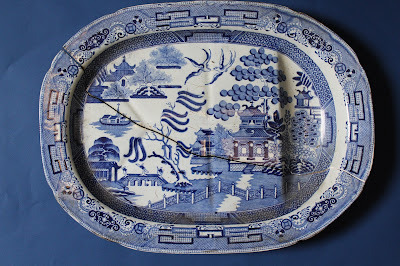 Initially there were a number of different patterns but the Willow pattern became the most popular. The background is always white and the image is blue. Once there was a wealthy Mandarin, who had a beautiful daughter (Koong-se). She had fallen in love with her father’s humble accounting assistant (Chang), angering her father (it was inappropriate for them to marry due to their difference in social class). He dismissed the young man and built a high fence around his house to keep the lovers apart. The Mandarin was planning for his daughter to marry a powerful Duke. The Duke arrived by boat to claim his bride, bearing a box of jewels as a gift. The wedding was to take place on the day the blossom fell from the willow tree. On the eve of the daughter’s wedding to the Duke, the young accountant, disguised as a servant, slipped into the palace unnoticed. As the lovers escaped with the jewels, the alarm was raised. They ran over a bridge, chased by the Mandarin, whip in hand. They eventually escaped on the Duke’s ship to the safety of a secluded island, where they lived happily for years. But one day, the Duke learned of their refuge. Hungry for revenge, he sent soldiers who captured the lovers and put them to death. The gods, moved by their plight, transformed the lovers into a pair of doves.